High-speed DVD-R media with 16x write support, available in a cost-effective cakebox package. Traditionally, Verbatim's top quality ensures perfect compatibility with DVD recorders and desktop recorders and long service life. The media has a standard capacity of 4.7 GB and is packed with 25 pieces. High-speed DVD-R media with 16x write support, available in a cost-effective cakebox package. 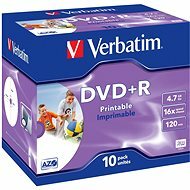 Traditionally, Verbatim's top quality ensures perfect compatibility with DVD recorders and desktop recorders and long service life. The media has a standard capacity of 4.7GB and is packed with 25 pieces. 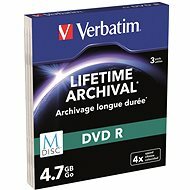 For shipping to other EU countries visit this page Verbatim DVD-R 16x, 25pcs cakebox. 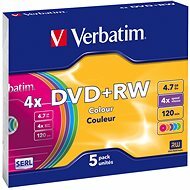 Für Versand nach Deutschland, besuchen Sie bitte Verbatim DVD-R 16x, 25 Stk Cakebox. Chcete doručit zboží do Česka? 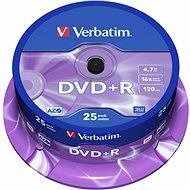 Prohlédněte si Verbatim DVD-R 16x, 25ks cakebox. Chcete doručiť tovar na Slovensko? 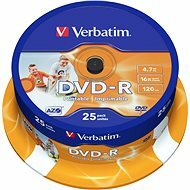 Prezrite si Verbatim DVD-R 16x, 25 ks cakebox. 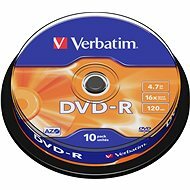 Für Versand nach Österreich, besuchen Sie bitte Verbatim DVD-R 16x, 25 Stk Cakebox. Magyarországra történő kiszállításért tekintse meg ezt a termékoldalt: Verbatim DVD-R 4,7 GB, 16x, 25 db-os cakebox.